Event Venue in Bavaro Beach - Have your perfect once-in-a-lifetime event! Are you looking for a place to have your once-in-a-lifetime event? Luxurious design and breathtaking views make this Bavaro beach event venue a special setting for every occasion. Particularly, coastal-inspired furnishings and gauzy curtains that sway in the breeze provide a backdrop that’s picture perfect. Moreover, a majestic main living area features sweeping views of the ocean and tall palms. And the grand highlight of our home: two terraces with ocean views as far as the eye can see. So, do you want to hold at this charming Bavaro beach event venue your most important event in your life? So that just book it right now with a direct booking Punta Cana on this page! We provide personalized service in Punta Cana. In this way, in case you need our help with any arrangement, transportation or car rental, just let us know. We will gladly provide you with the best service in Punta Cana during your stay at this charming Bavaro beach event venue. It was a fantastic Trip. The ocean view is the best in the area! We'll definitely visit this place again soon. The Team was really helpful we booked a Yacht and Coco Bongo! It was an insanely great experience. I was looking for an option for my hen party for a few days. A friend of mine recommended this page to me. She prefers Punta Cana for her holidays and always chooses an apartment on this page. First I looked through different apartments and villas for 8 people, but then decided to contact directly. I received an email with several apartments set directly on the beach. But this apartment attracted my attention most of all. It is awesome! The team helped me organize my hen party exactly as I wanted! They decorated it with balloons, flowers, helped organize snacks, champagne, sweets. We spent there 3 days. My girls really liked the weekend. And I could not even dream of a better hen party! My family stayed here for my sister's luxury beach wedding. The experience we had was heavenly. No doubt, the staffs were of a good report, the pictures were not misleading as everything was the way it should be. Free WiFi, adorable view, we enjoyed the natural breeze. I tell you there is a good life waiting for you at the Perfect event venue in Punta Cana on the beach! 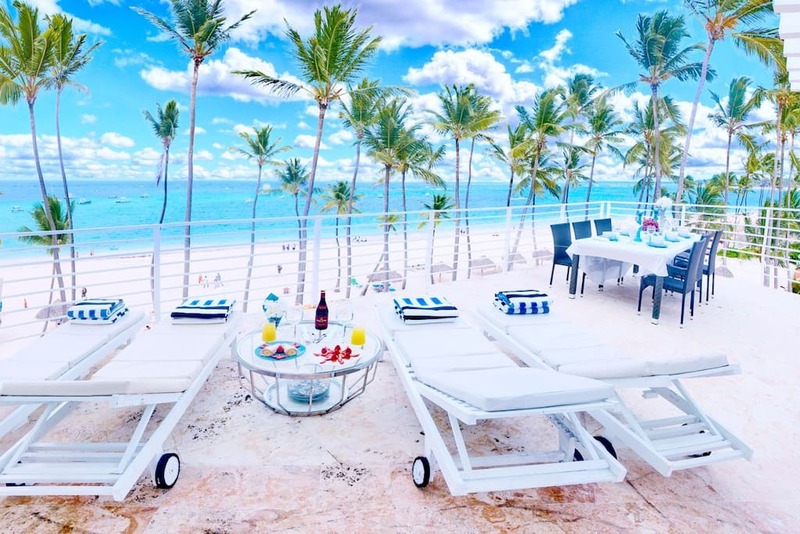 Is this Bavaro beach event venue a Punta Cana ocean view vacation rental? Yes, this Bavaro beach event venue is a Punta Cana ocean view vacation rental. How can I book this Punta Cana beach house? 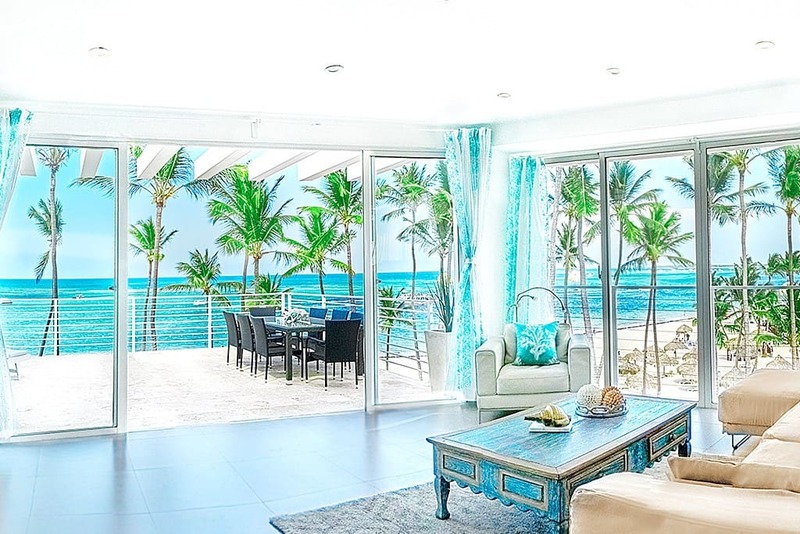 You can book this Punta Cana beach house with a direct booking Punta Cana without any commission fee on this page or book it on Airbnb Punta Cana. 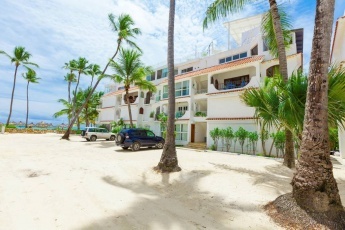 Our Punta Cana beach house is located right on the beach Los Corales Punta Cana. Can I book a 3 day vacation Punta Cana at this beach property Bavaro? 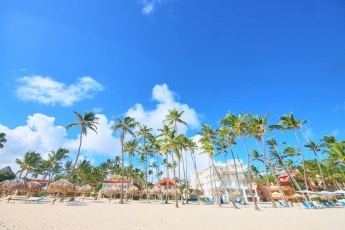 Yes, you can book this beach property Bavaro for your 3 day trip to Punta Cana. 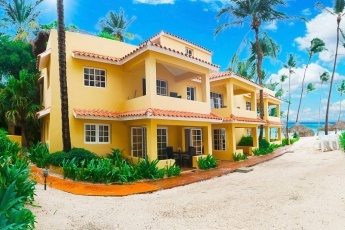 Best restaurants, bars, fruit stands are within 5-7 min walking distance from this Punta Cana ocean view vacation rental. We would like to celebrate our wedding anniversary in Punta Cana with our family. What are romantic things to do Punta Cana? 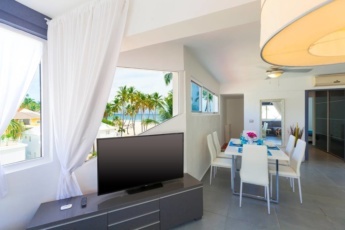 You can book this charming beach property Bavaro for your wedding anniversary. This Bavaro beach event venue accommodates up to 10 guests. Moreover, we provide personalized service in Punta Cana and we can arrange a celebratory family dinner or a romantic program for your taste: candlelight dinner, couples massage, champagne breakfast, etc. Do you organize Punta Cana weddings? We provide personalized service in Punta Cana. We will gladly help you with the arrangements you may need to organize your Punta Cana wedding. You can also book this Bavaro beach event venue, located right on the beach, for your Punta Cana wedding day. Is this Bavaro beach event venue situated at Los Corales beach Punta Cana? Yes, our Bavaro beach event venue is located at the famous Los Corales beach Punta Cana. 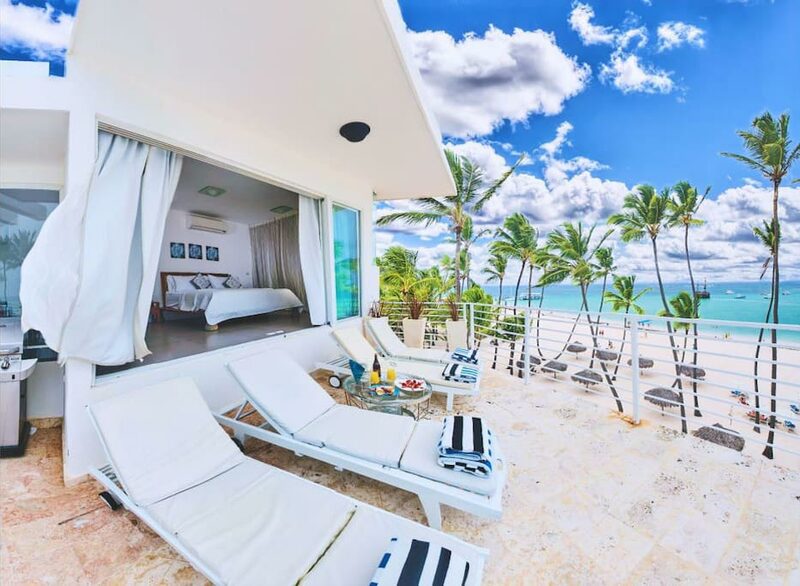 How many guests does this Punta Cana ocean view vacation rental accommodate? 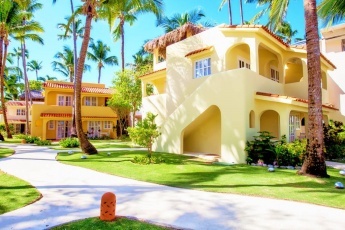 This charming Punta Cana ocean view vacation rental has 4 bedrooms and accommodates up to 10 guests. 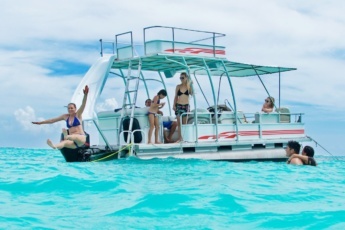 Book right now your holiday to Punta Cana with a direct booking Punta Cana without any commission fee. 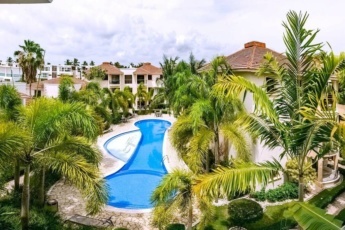 Is this Punta Cana ocean view vacation rental far from the Punta Cana international airport? 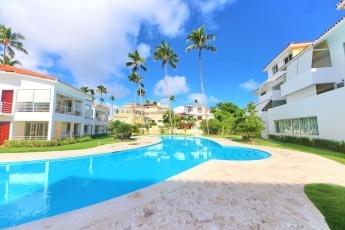 Our beach property Bavaro is 30-minute drive from the international airport Punta Cana. We provide personalized service in Punta Cana and we will be glad to organize a comfortable transportation for your from the airport. What if I have any question or problem during my stay at this beach property Dominicana? We provide personalized service in Punta Cana. You will have your personal resort concierge, who will check you in and provide personal information and personalized guidance. If you have a problem or question during your stay at our beach property Dominicana, do not hesitate to contact your personal resort conciege. 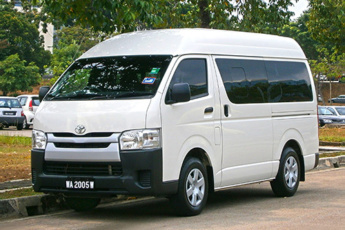 He also will be glad to help you with the best Punta Cana excursions or transportation.